Hand dubbed with Dolby NR, fluorescent blue or purple shells, and includes download code. 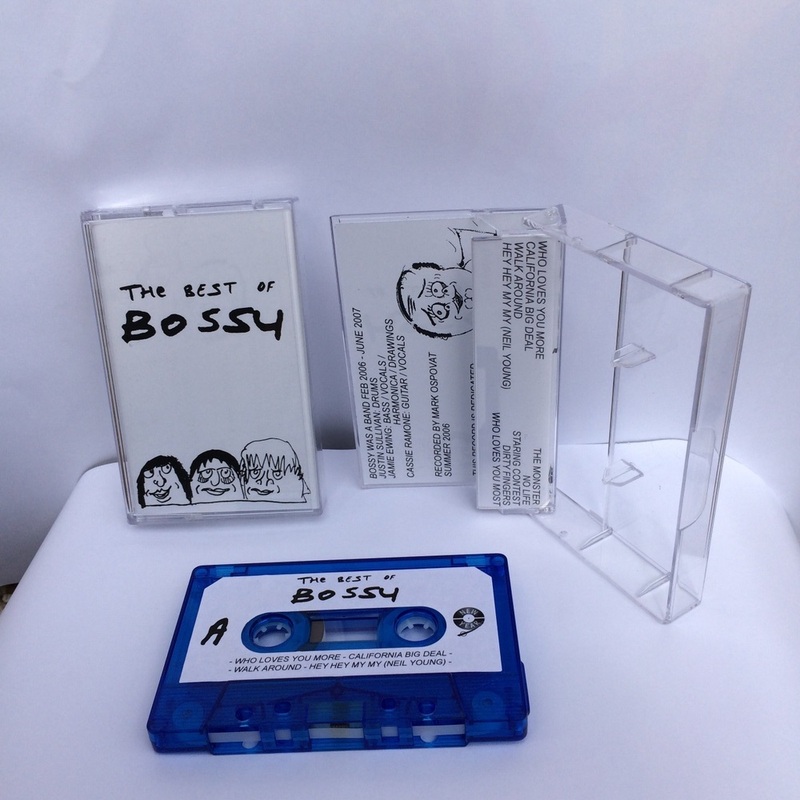 “Bossy was a band Feb 2006 – June 2007. “So here’s my story and ‘some’ background info for NYR003 “The Best of Bossy”. Bossy was a band in NY 2006-2007, the trio of Justin Sullivan (drums), Jamie Ewing (bass, vocals, hamonica) and Cassie Ramone (guitar, vocals). I picked up this LP 2 years ago to get a bit of background on a couple of my favourite – Vivian Girls (Cassie) and The Babies (Cassie and Justin) – after getting hooked on JUST one Bossy song that I heard online. Turns out this ‘Best of’ is pretty damn good…well, that’s an understatement. Short and sweet, never a dull moment, sticking with simple punk approaches to songs and I’m hooked on every one. The closing track “Who Loves You Most” is perfect, it’s the only song with Jamie on lead vocals in what I think is a real heartfelt acoustic based take on the opener “Who Loves You More”. Jamie was a great guitarist, bassist, vocalist who played in loads of punk bands including Bent Outta Shape, The Radio Faces (with Justin), and more. Similar thing for Justin, most notably with the band Ringers, and having his shot at vocals with The Insurgent. Now he plays drums with KEVIN MORBY. Cassie released a solo album last year and started up a couple of bands recently, like Melt. It’s great to be able to pick up on most of their music over the years. The original release of this album was vinyl only in 2009 on Wild World, it comes up on Discogs every few months and you’re looking at parting with around £20 for it (since 2014). My vinyl warped so I wanted to see what could be done…after being the drunkest man alive and talking to Justin about Bossy one night, of course. These are the best sounding tapes I’ve made. They’ve been hand dubbed with Dolby NR which really makes all the difference! The artwork stays true to the record, which features Jamie’s drawings. This album should keep on existing, so here it is – original audio and on tape for you to pick up for cheap (5 times less than the vinyl! ), and more importantly, indefinitely.